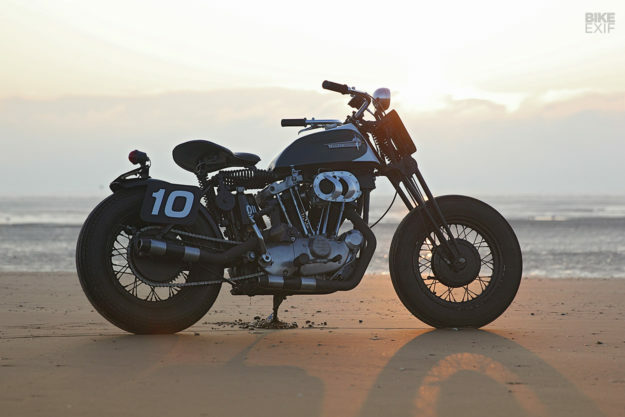 One of the greatest spectacles in motorcycling is The Race Of Gentlemen, held every summer on the Jersey shore. 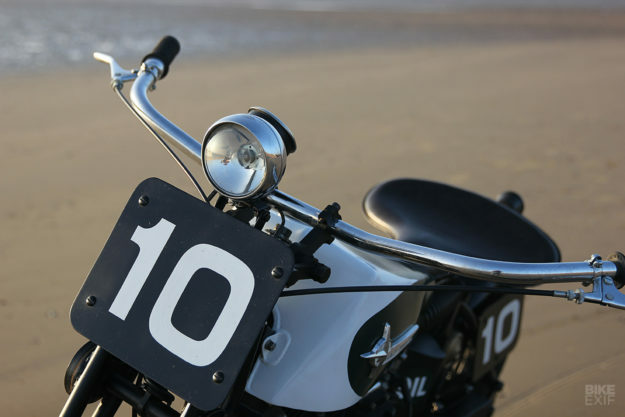 It’s a recreation of the beach sprints of the late 1940s and early 1950s, and the cars and bikes are modified to match—chopped, bobbed and hopped up, designed to look just like racers from the first half of the twentieth century. 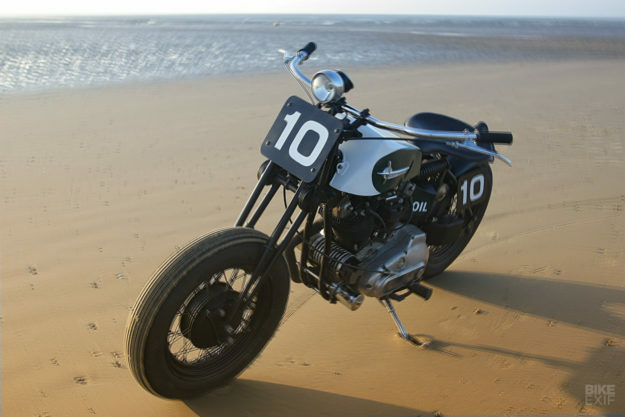 As you can imagine, it’s an expensive pastime: entrants have to be pre-approved by the TROG organizers, who are looking for ‘period correct.’ But there’s more than one way to get that delightful vintage beach racer vibe, as British bike builder Shaun Fenton has discovered. Shaun’s day job is making films for the Hoxton Moto YouTube channel, but he’s just as good at spinning spanners. 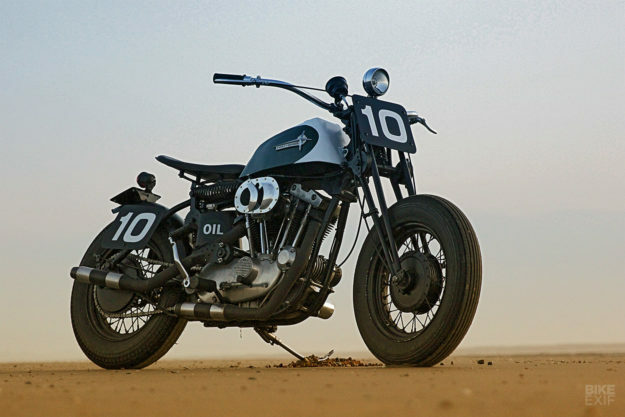 Like most ‘shed builders’ he loves all things two-wheeled, but there’s nothing amateur about the results: his creations have been displayed at the huge Bike Shed show in London. 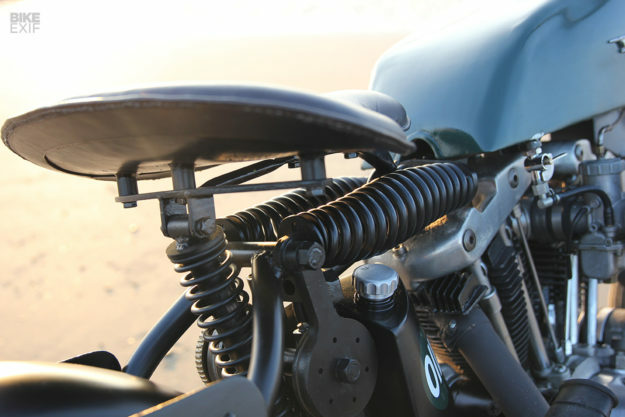 The first job was to find a cheap Harley to use as a donor bike, and when Shaun stumbled across a 1970s Ironhead Sportster XLCH, he knew he’d found The One. 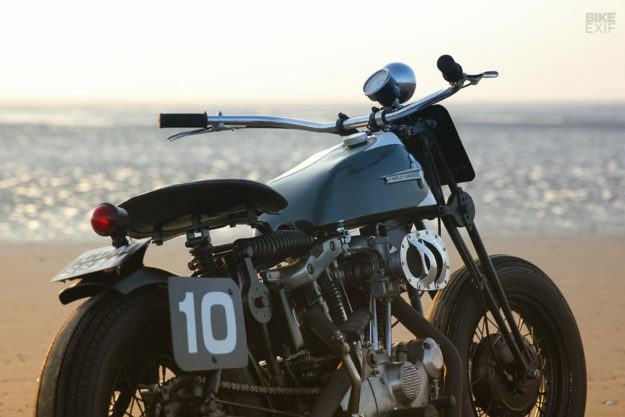 “The bike had been imported into the UK as a restoration project, but aside from occasional tinkering, it had languished in a garage for over ten years.” Without revealing his intentions, Shaun struck a deal—and the previous owner’s dream became his dream. The Sportster was stripped down to the engine and frame. Then Shaun put a call in to Jake Robbins Engineering—a renowned girder fork specialist—to fit a hand-built front end and a rigid rear. “After a short one-way discussion I was bamboozled by his vision. Jake persuaded me to let him loose on the rear suspension, and install a friction-damped, twin spring, live cantilever spring frame.” This was Jake’s homage to the Bentley & Draper spring frame, as fitted to inter-War Brough Superiors. “Like a man possessed, the angle grinder came out, the welder spluttered and snorted, and he smashed out the conversion,” says Shaun. 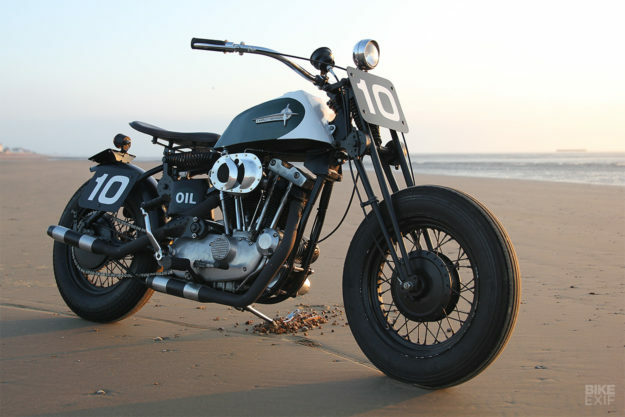 The original Sportster rear wheel and brake survived intact, but at the front Shaun has fitted a 16’’ rim and drum brake from an Enfield Bullet. The tires are vintage patterns from Dunlop and Coker. After much carving, rasping and choking on foam particles, a shape emerged. Shaun cut and bent sections of the tank, then mounted the lugs and fittings before welding it all together. After getting the design and stance right, he had to find a way to mount the essential oil tank and battery box. That meant building an oil tank from scratch, rubber mounted in the small space between the engine and frame. 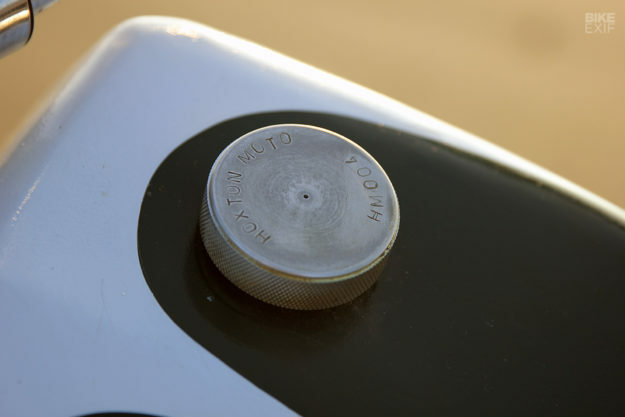 The battery box was yet another hand built feature, and mounted on the swingarm. A predominant feature of the XLCH Sporty is the air intake housing. Shaun looked at aftermarket designs—but decided that since he’d got this far, he may as well fabricate his own. 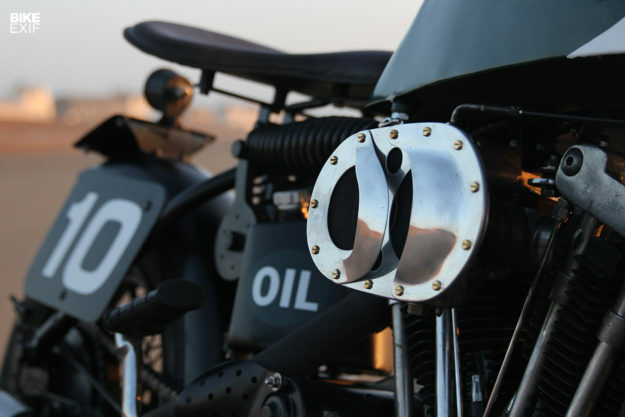 With the leftover metal from the tank build (and a few hand tools) the air intake shape evolved into an eye-catching design. The rest of the bike came together quickly: the rear fender and lights were auto jumble finds, and Shaun handled the control cables and wiring himself. 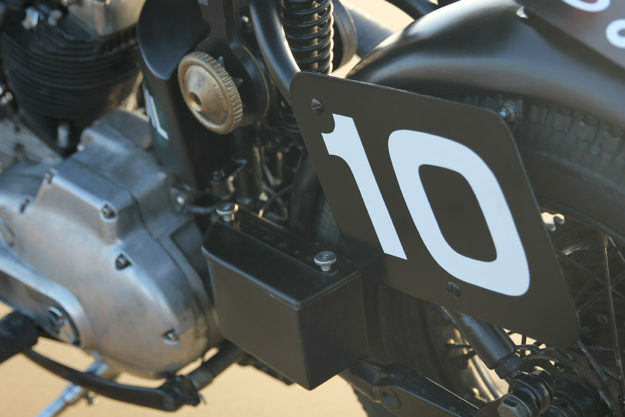 To finish off the beach racer look, he fabricated and mounted the race plates. Well, we’re guessing they’d be mightily impressed—as are we.